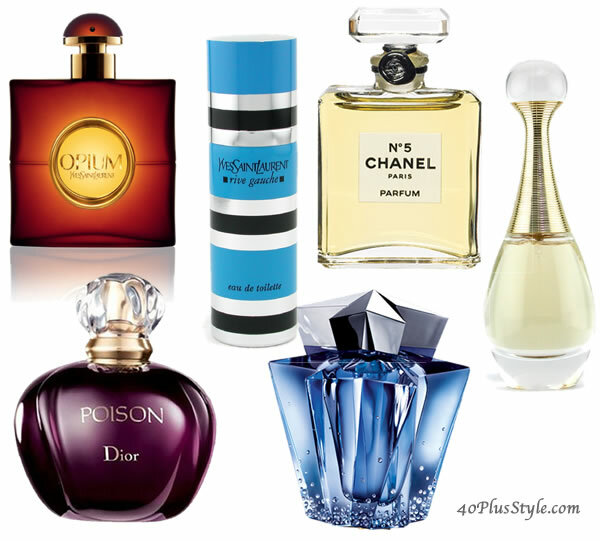 40+ Style » Skin » How important is perfume for your style? How important is perfume for your style? I have never discussed perfumes on this site. Yet it can be a major component of style for many women. Coco Chanel certainly thought so! I decided to do a bit of ‘sniffing around’ to find out about how important perfumes are for other women and which ones are the most popular. 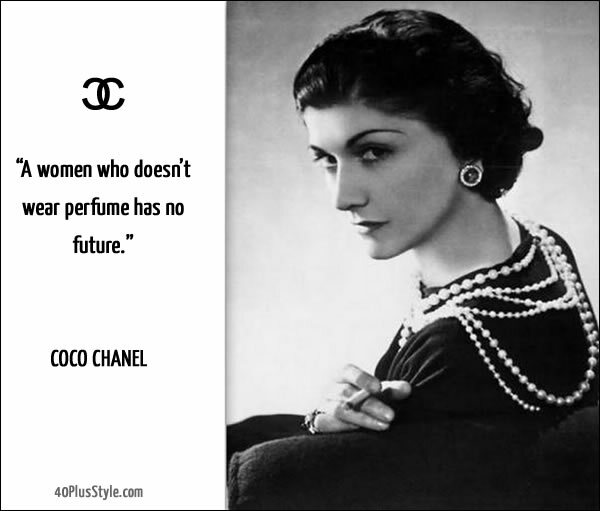 Coco Chanel was of course one of the most famous perfume lovers. She was very much involved in developing her signature scent Chanel No 5, which is still one of the most popular perfumes today. The Washingtonian recently reported that Michelle Obama loves Creed Love in White. She apparently loves soft, gracious and sweet perfumes. Audrey Hepburn was a fan of Creed Spring Flower. Due to her close collaboration with Givenchy though, he created a perfume exclusively for her, L’Interdit Givenchy, which she loved as well. Apparently she was rather disappointed when he decided to release this perfume on the market. Donatella Versace has so many perfumes, she has a gigantic display cabinet full of them. We all know what Marilyn Monroe liked best! What are the most famous perfumes in the world? Still the most famous perfume of all and the most sold. Poison was very popular in the 80s but is gaining popularity while J’Adore is currently Dior most popular perfume. Opium is heavy and sensual while Rive Gauche is more feminine and fresh. The latter was a long-time favorite of mine. Loved by many, if only for its beautifully designed bottle. Now I must admit that smell has never been a major component of my own style as I’m not such a sensory person. Although I like to smell fresh at all times, of course, I prefer my perfume to be as subtle as possible. I would love to hear how it is for you! How important is perfume to your style? Do you stick with one perfume or are you constantly trying new scents? What is your current favorite? I don’t wear perfume on a daily basis. Maybe on special occasions. My fav is Chanel No. 5 only b/c it reminds me of my mom. I remember as kids, we’d put our money together and buy her this perfume for Mother’s Day. She’s no longer with us but the scent brings back memories of my beautiful mom. Unfortunately I have great friends who are deathly allergic so wear it only at events where they are not present…. Ay, that’s not good. So what do year when you do wear a perfume? At one of time of another I wear and own all of the perfumes on your list. The perfumes that I wear now are usually very soft since the strong ones give me the sniffles. I wear No. 5 almost exclusively. My only other fragrance: No. 19. Interesting! Great to get your feedback. I Love the scent of perfume on my body before I get dressed and my favorite is Insolence by Guerlain. I never leave home without it. Another vote for Insolence. I’m curious now. Must go to the shops and smell it! I usually wear a scent every day, but if I forget, I do not panic. I think it is feminine and the scent you chose underlines your personality. Difficult is that my husband likes heavy scents like Poison and I like flowery, light scents like Anaïs Anaïs. He thinks my choices smell like soap. At first I ignored it but you do want to smell nice for the person you love, don’t you? And when one day he went up to a strange lady saying he thought “she smelled so nice, what was she wearing?” I decided to try and find a scent we both like. (I cannot have him sniffing around other women, now can I?) I like Insolence by Guerlain, Zen by Shi Sheido (the yellow version) and Spellbound by Estee Lauder although I have not used the latter for a long time. haha Greetje. Your story made me laugh. No you certainly cannot have him sniffing around other women! Thanks for your feedback in preferences. It’s great to see what everyone likes. Aren’t we all so lucky to have the wonderful Greetje entertain us with her hilarious stories? A perfume is the last touch before I leave the house. My preference is the elegant, warm range but I can’t say I have a favourite and always feel overwhelmed by the variety of perfumes. I do too. It’s so difficult to find a new one! I love Chanel No5. I have used Coco but not for a while. I went through a phase where perfume used to give me a headache but I seem to be ok now. I also like some of the Origins fragrances like Ginger Essence which I got for my birthday last year. I had both a Coco phase and a No. 5 phase. I’m using Prada now but am in the mood for something new…. I wear perfume every day, it is a small luxury and I love it. My favorites are light, citrusy scents which work well in Florida. The heavier perfumes don’t do well here in the summer., at least in my opinion. So currently I have Dior Addict II, Prada Iris, Aqua di Gioia. One of my favorites is also Givenchy Ange ou Demon le Secret – love that, but it tends to fade quickly. Must try No. 5 again ! Yes, that’s probably why I prefer something light too. Interesting choices. I feel like going to the shops and trying out all these scents! I have worked as a beautician in the Douglas stores, so I had the possibility to try out a lot of perfumes. Every year a lot of new ones appear on the market, but I am faithfull to my Jardin de Bagatelle by Guerlain, but when I go out in the evening I use Jaipur by Boucheron which is a little more oriental. I don’t feel dressed when I don’t wear a perfume, it is a part of the total package of being me. My #1 favorite is Quelques Fleurs, having been using it since college days. Next is Miss Dior and Paloma Piccaso (that red and black bottle). However, applying perfume has not been a part of my grooming for the past 15 years. I don’t like scent on my clothing items. It feels unclean to put on a jacket that has leftover perfume. Being older for me means going back to basic. By not doing makeup (except lash curling, brow grooming, and SPF30 clear lip balm) and scent (except real vanilla used in bar soap and oil), I feel freer without all the steps I used to do in my 20’s and 30’s. I tend to switch perfumes with the seasons, one for spring-summer and another for fall-winter. My current two favorites are Michael Kors Daisy (for spring/summer) or Jo Malone Nectarine honey. For fall/winter I use Vicot & Rolf Flowerbomb. If you haven’t tried Jo Malone perfume, I highly recommend you give it a try. There are a vairty of wonderful scents that you can mix and match and they are very subtle. Trina, I have had Jo Malone perfume on my Christmas list for years now but Santa still hasn’t brought me any! I love perfume but I don’t always remember to wear it because I don’t wear it on a daily basis (due to the nature of my work). I have always loved Chanel No 5 and wouldn’t be without it. I always take Emporio Armani ‘Elle/She’ on holiday. It’s been around a while now but I love it – it’s my go to scent – and it comes in a metal tube so is perfect for packing. The other two perfumes that I currently have at D&G’s ‘The One’ which is quite subtle and ‘Acqua di Gioia’ by Georgio Armani, which has a wonderfully distinctive citrus fresh smell (I just had a squirt!) and is lovely for the summer (currently cold and raining but I can close my eyes and dream!). I remember the older perfumes like Opium but I find them very cloying and heavy. I am 76 years old and have been wearing L’air du Temps by Nina Ricci for the last 40 years. It suits my skin & my nose. Thanks for your feedback Helene and your first comment at 40+Style! Am I the only woman in the world who has never liked Chanel No. 5?? My favorite is a seldom-talked-about perfume called 29, Faubourg, by Hermes. That’s for dress up. Then, I like Safari by Ralph Lauren, which apparently is now unavailable. But for everyday wear, I still adore the incomparable Wind Song by Prince Matchabelli, which makes me feel 17 again, if for only a few minutes when I spritz it on. Hi Coco. Your comment stopped me in my tracks! It could have been written by me! I never cared for Chanel No.5 either and I love 24 Faubourg. I have worn Safari for the last 15 years until it was discontinued a while back. The good news is that I found it again at Heathrow airport about a month ago…not sure how or why it was available but just so glad to be able to get some again! Aha! I had a feeling there was someone else out there who felt as I did! And thanks for the tip on finding Safari again. Maybe if word gets around Mr. Lauren will bring it back on the American market. Oops, I meant 24, Faubourg. Typo. Chanel No 5 in the winter, but Red Roses by Jo Malone when it’s warm. I used to wear 24 Faubourg, thanks for the reminder: I may pick up a bottle! I am an Angel fan. It’s the only perfume that I’ve had men, women and my students consistently say how amazing it is. I’d love to find another option that I love as much, but haven’t had any luck. I love do many perfume. Many on my rack of wardrobe. But, the most that I really love is angel, then jadore. Angel so worthy to buy. I never like channel, but wanna try no5 and faubourg no24. Btw, I am the addicted of perfume. I hv alien, jpg, the one by d&g, gucci guilty, Ralph by Ralph Lauren, amor amor by cacharel, Issey miyaki, burberry weekend, lady million….and bla bla bla….